One of the books on my sidebar for the past few months is A Good Match: Library Career Opportunities for Graduates of Liberal Arts Colleges. It was published by ALA as part of its "ALA Research Series" and was written by my first boss as a professional Rebecca Watson-Boone. It is a serious research work. There were 864 people who answered the survey which was 11 pages (in the book) and had a total of 82 questions, some of which were open-ended and others had multiple sub-questions. It includes a rather complete survey of the literature on career choices and paths. She also compares between institutions and across the generations. There were some generational differences, as well as differences between the graduates of specific institutions. It is an interesting work, well worth the investment of the time to read it. In the interest of full disclosure, I worked for Rebecca at the University of Arizona in the mid-1970s. It was a temporary position as the Business Reference Librarian in the brand new Central Reference Department of the University of Arizona Main Library. Rebecca and I have stayed in touch over the years, primarily through ALA. She is now an independent scholar living in New Mexico (of which I am personally jealous). I know that I am late....but I went away for the Thanksgiving holiday, and turned off electronics for the duration. Yesterday (Monday) was left to catch up -- both at home and at work. I have been composing this post in my head for some time. For being healthy. While I have pus some weight back on, I am still close to my lower band of weight, and feel great because of that! It has been an interesting and surprising year. It was just a year ago that I left Bridgeport to move to Wisconsin. It was the right decision. ridden "shotgun" in a police cruiser? Until tonight, I had not. Now, thanks to Leadership Eau Claire (LEC) ,I have. 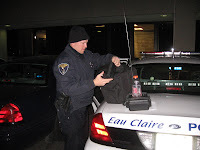 Part of Leadership Eau Claire was an opportunity for a two hour "ride along" with an Eau Claire Police Officer. 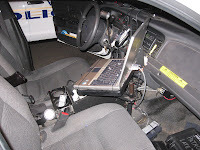 I got to sit in the seat at the right, for what turned out to be a three hour experience with Officer Greg Webber. Greg was a great guide, and was (I think) disappointed that there was no chase, no arrest, and no official reason to turn on the lights. [He did turn them on once, in the City Garage parking lot just so we could see what they looked like from inside the car.] Greg was candid and an excellent guide. I got there early, and got the "shotgun" seat. Our first call was to take a complaint of harassment from what was a domestic dispute between two people who had been divorced for two years. We heard her side first, and then went back to HQ to pick up my LEC colleague. From the parking lot, Officer Webber called him for a long, rambling conversation. He followed up with a quick call back to her as we cruised. The next call was to serve as back up for a complaint about underaged drinking. Since juveniles were involved, my colleague and I spent considerable time standing and waiting. The result of the call was for Officer Webber to write a citation (not the first for the party cited), as well as notify the City/County Health Department of possible violations over the state of the apartment. We sat for some paperwork, and to "look for a violation." While cruising, we got a third call of a possible suicide threat. In a neighborhood not far from where I live, a man was "breaking up with his wife" who then threatened suicide. It turned out to be more of a domestic dispute than anything else, and did not take nearly as much time as first thought. Then it was time to gas up, and return the car to HQ for the next shift. So what did I learn? Well, first that there is a whole lot more paperwork to policing than you might think. Second that cops often have interesting backgrounds. Officer Webber has a bachelor's degree in biology with a minor in chemistry (I think). He was a warden for the Department of Natural Resources and an officer in the County Jail before joining the police force. Third, that cops are often as much social worker as they are enforcement officers. It was an eye-opening experience. And I am glad I did not have to ride in the back of the car!!! I started to write about this before the Thanksgiving holiday when I came across a post from Beth Hoffman. She cites several posts from Jason Griffey in his blog Pattern Recognition including this one with guesses about the finances. I know I wrote a comment which showed that Jason's guess were not far off. Today, I find that my friend Karen Schneider has ratcheted the discussion up a notch. These were follow-up posts to one on defining a meeting, and another on defining the notion of work (within ALA). I have been posting infrequently lately (and no, I am also not the Annoyed Librarian), and was way behind on my blog reading. However, a quiet weekend has allowed me to get completely caught up on my Bloglines reading. There were two posts by Helen Blowers which caught my eye and got me thinking. I am going to talk about them in the reverse order in which she posted them. For me, it is a fundamental truth in leadership. The other post is about Jack Welch. It links to a page on the Stanford Graduate School of Business web site which quotes Jack from a visit there. The quote is a good one, and does have a lot to say about leadership. It got me to wondering about how much he really believes it. During the early 1980s he was dubbed "Neutron Jack" (in reference to the neutron bomb) for eliminating employees while leaving buildings intact. In Jack: Straight From The Gut, Welch states that GE had 411,000 employees at the end of 1980, and 299,000 at the end of 1985. Of the 112,000 who left the payroll, 37,000 were in sold businesses, and 81,000 were reduced in continuing businesses. Welch has also received criticism over the years for his lack of compassion for the middle class and working class. Welch has publicly stated that he is not concerned with the discrepancy between the salaries of top-paid CEOs and those of average workers. I guess I worry that a true (good/moral) leader is going to show many of the qualities which Helene points to, but should also care about those s/he leads. That is the sign of an authentic leader. The latest edition of American Libraries Direct included what I consider bad news. Bernie Margolis, the President of the Boston Public Library [i.e. the library director there], is not having his contract renewed. On November 4, Boston.com (the online version of the Boston Globe) reported that the Board agenda included a discussion of not renewing his contract when it expires on June 30, 2008. Today's issue reports that one of the issues is about support for the branches. While my current library has only one location, I have had experience with branches. One thing that annoys me about the article is the constant reference to the "main branch." That is an oxymoron! Either it is the "main" or "headquarters" or it is a "branch." A key concept that people like the mayor of Boston clearly do not understand is that the health of a system is dependent on the main/headquarters location. While there are a few library systems without a "main" branch (Baltimore County comes to mind), for the vast majority, "main" is where the administration is, where technical services is located, where the historical archives, strongest and deepest collection, and most talented reference staff. If you do not support the central location, then the branches whither. One analogy which occurred to me as I was stewing over this is to use that of the body. Part of what Bernie did with Boston was to do open heart surgery and made the Copley Square main library back into the key library it needs to be. What the mayor seems to want to do is to do major surgery on the arms and legs and leave the heart to disintegrate. (Yes, I may be over the top in the analogy, but I really believe that the mayor and library board do not understand this important relationship. To me, it is sad because Bernie is such an articulate and thoughtful library leader. I know that he will land on his feet somewhere else. I have had a similar experience in the past and wound up in a much better place as a result. Pirate Treasure (a place to buy "stuff). My friend Karen Schneider posted a comment on my recent ramblings on this topic. In it she says "I've commented on my blog, but basically I've concluded, well, you're wrong and I'm right. ;-)" Well, I went off to look at what she said, because Karen is not only a friend, but a great writer, and often makes me think enough to sometimes change my mind. First, let me note that she only really comments on the second half of my post, the part about the Annoyed Librarian. I posted to her blog that I think we actually agree. Her comments about the "us/them" language are very compelling, and is a perspective about which I had not thought. She is correct in that using that kind of inflammatory language sets up the kind of false dichotomy that makes it harder to build any kind of team. If you want an enterprise-wide initiative, if you want everyone to be involved, at some point, as leader, you have to accept a certain bumpy, uneven quality of work and just lead them through it to comfort and consistency. I sure have thought about Sara's words, and even acted in that way at times without having had the ability to put the thought into words. I still maintain, that while some focus the Library 2.0 discussion on "only" the technology aspects, libraries that are genuinely "2.0" libraries will address all of the customer service/user-centered issues. That is among the places where I think that Karen and I agree. I am back to work. What an adventure: six different beds in seven nights; drove 8 different cars registered in 5 different states mostly in two towns! When I first got the phone call, the hospital staff said "We're trying to keep her alive until everyone gets here." She went home from the hospital a week ago today, and by last weekend, several of us were itching to leave since she was back to her feisty self. I'm now thinking that there was a possible mis-diagnosis. My mother has had a blood disease for a number of years. She wound up in the hospital dehydrated and almost in septic shock. But after a couple of days of treatment which included IV antibiotics and some blood transfusions, she pulled out of it. I am happy to be home, and able to sleep in my own bed. (I think we all underestimate the importance of that.) The experience of pretty much living with my brothers and sisters as adults was very different than when we were younger. While we often see each other, we are usually also surrounded by spouses and kids. This time, for most of the time, it was just us. That created a different dynamic. The age difference of 12 years from eldest to youngest is also no longer as significant as it used to be. In group dynamic we became a "high functioning team" as we wrestled with some pretty important issues. It was really good. While it was incredibly disruptive to each of our lives, I think we all also walked away with better connections to each other. Stay tuned for some posts on the reading I completed while traveling and while there. Those posts will be very different than this. Finally, I want to thank those who sent me personal notes. The level of support I received from my staff, board, and electronic friends was heartwarming. Thanks. I've been in Connecticut since Monday afternoon. On Saturday, I was by a lake in Wisconsin, blissfully without my cell phone. 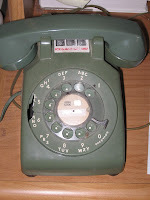 Sunday when I got service, I checked, and there was a voice mail from a sister and a son, and a text from that son. I started calling and found out that my mother was in the hospital and was in serious shape. So, the calls to the airlines started, and I was on a mid-day flight on Monday. Since then, I have seen all my siblings (there are seven), numerous nieces, nephews, and spouse-in-laws, and vast numbers of my mother's friends. My mother is now at her home with hospice care and a schedule of her kids and their spouses who will be with her. I have limited Internet access, and will certainly not post again for at least a week, unless the truly dire happens. I am now scheduled to be back here in late September/early October for my turn on the care/watch schedule we have developed. This is an adventure, but one I do not want. In reading my Bloglines (no, I have not looked at Bloglines Beta yet), I found two interesting and contrasting posts. David Lee King proposes a revision to his visual presentation of a Library and Library 2.0 ideas. While his first showed a spectrum, and placed people and ideas along that spectrum, the two dimensionality of the line does not reflect what the whole Library 2.0 movement is about. At the same time, the Annoyed Librarian writes her posts under an anonymous pseudonym. [This bugs John N. Berry III, and I guess that is why I like it!] Some of Annoyed's posts are about the public, and there is more than a little sarcasm thrown in. On the other hand, how many of us, at one time or another, have not had (but not expressed) thoughts just like Annoyed? Not so many hands raised. This time Annoyed hits the mark (or at least a little closer) with "The Cult of the Twopointopia." It is not "either/or," I like to think of it as "both/and." We have new tools, we need to use them. I will note, that Annoyed does use a healthy (well, maybe even more than a healthy) dose of sarcasm in her writing. But don't let that put you off. I think most folks dealing with Library 2.0 issues are somewhere between the two extremes of feelings on the topic. Michael Porter (aka Libraryman) posted this incredibly funny video clip under the title: "Disco Dancing for Peace in the Biblioblogosphere." There is music, and be prepared to laugh! I picked this up from Stephen Abram. I am surprised that I am only 1% point lower than he is! I had been very, very far behind in reading blogs....I started falling behind just before ALA Annual, and it got worse as the summer wore on. I have finally caught up. One post caught my eye, and it is a LJ [that's Library Journal not Live Journal] column by the blogging Michaels (Casey and Stephens). It is called The Open Door Director. It is so much the truth when they say "It's no longer enough for the library director simply to keep the place running. Today's director is politician and lobbyist, fundraiser and spokesperson, juggling all of these titles while administering a library." And that sure is true. I'm still working on getting all aspects of Library 2.0 into my head and heart. But it is reassuring to read that I am doing some of the right things. One of the non-library specific blogs I read is a Wisconsin-based blog I picked up on before I even moved here. Can't tell you where or when, because I don't remember. I just added it to my Bloglines account. The blog is: 800-CEO-READ. Monday's post is great and is called "Ending." It quotes that wonderful book Up the Organization by Robert Townsend which was originally published in 1970, and has been recently re-published. It's about eleven times as easy to start something as it is to stop something. But ideas are good for a limited time--but not forever. If only we all could learn to LIVE this rule, not just we who are administrators, but our customers (that's what we call them in Eau Claire), or users, or patrons. There *always* seems to be someone (and it is often only ONE) who objects to an organization stopping doing something that is no longer needed or no longer part of the core mission. I have the new Harry Potter and am reading it. Enough said! [And the weather here -- rainy, dreary -- has been perfect for it! The Well Dressed Librarian has a great post with this title! As one who is a "Michael" not "Mike" I can very much identify with him! I can tell a sales rep who has never met me is calling when he says "Hi, Mike!" One of my email accounts has a sig file with "My friends call me Michael!" as the end. Remember that! I'm in a new city, and there is a lot to learn. Fortunately I was accepted into the Chamber of Commerce' program Leadership Eau Claire. I expect that it is similar to the program in Bridgeport called Leadership Greater Bridgeport, and the Eau Claire experience comes with high recommendations from those who have participated in the past. The end of this month will see the two day retreat. Then it will be once a month through the fall, winter, and spring. I expect to get a lot out of the experience, and to learn a great deal more about my new hometown. Have you ever wanted to serve on an ALA Committee? Well, now is the time to get your name in for committee appointments which begin after ALA Annual in Anaheim. Most member are appointments for two years, and chairs are appointed for one year as chair (and may or may not already be members of that committee). ALA President-Elect Jim Rettig is seeking applications and nominations for appointments to 2008-2009 ALA and Council committees. He will fill slots on the following committees: Accreditation; American Libraries Advisory; Awards; Budget Analysis and Review; Chapter Relations; Conference; Constitution and Bylaws; Council Orientation; Diversity; Education; Election; Human Resource Development and Recruitment Advisory; Information Technology Policy Advisory; Intellectual Freedom; International Relations; Legislation; Literacy; Literacy and Outreach Services Advisory; Membership; Membership Meetings; Nominating (Deadline for Nominating Committee applications is September 1, 2007); Organization; Orientation, Training, and Leadership Development; Policy Monitoring (current Council members only); Professional Ethics; Public and Cultural Programs Advisory; Public Awareness; Publishing; Research and Statistics; Resolutions; Rural, Native and Tribal Libraries of All Kinds; Scholarships and Study Grants; Status of Women in Librarianship; Website Advisory; ALA-Children's Book Council (Joint); ALA-Association of American Publishers (Joint) and ALA-Society of American Archivists-American Association of Museums (Joint). Committee charges can be found in the ALA Handbook of Organization. All applicants must complete and submit the electronic 2008-2009 ALA Committee Volunteer Form. The form is available on the ALA web site. The deadline for submission of committee volunteer applications and nominations is Monday, December 3, 2007, which the exception of the Nominating Committee, with is September 1, 2007. Geographical location, type of library, gender, ethnicity, previous committee work (not necessarily with ALA), ALA and related experience, and other factors are considered when the committee slates are compiled in order to ensure broad representation and diversity on all committees. The ALA Committee on Committees and Committee on Appointments will assist ALA President-Elect Jim Rettig in making appointments. 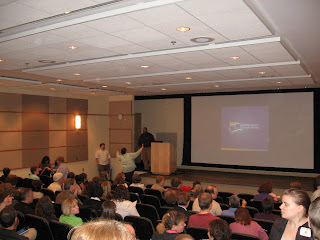 Committee appointees will receive appointment letters after the 2008 ALA Midwinter Meeting in Philadelphia, PA. Appointees will begin their committee service after the 2008 ALA Annual Conference in Anaheim, CA. Go for it. If you don't ask, you don't get! Bridges -- Money can solve problems, how does that help libraries? I've started (again) to catch up on reading blogs through my aggregator. One of the first I always look at is Free Range Librarian. Karen is a good friend and a great writer. One of her recent posts led me to Garrison Keillor's article "Bridges aren't supposed to fall down." At one point he says, "The way to get money to fix a bridge is for it to collapse and kill people, and so Congress promptly awarded Minnesota $250 million for the fallen I-35W." And he is right. Second, the solution is to throw money at the problem after the fact. Fat lot of good that does for those who died. The third thing is that libraries are always looking for money. Most libraries are either underfunded or limited in what services can be provided because of funding restrictions. For those working in areas with strict "tax caps" one of the (I believe, unintended) consequences of voter imposed limitations like Proposition 13 (in California) and Proposition 2 1/2 (in Massachusetts) is that library services compete with police, fire, and other social services. Part of the bigger picture is that funding libraries will reduce crime and the need for social services, it will create more jobs and a better economy. We, as librarians, just have not made the case well enough, yet. My rant for the day is over....who know what is next. To clean up my sidebar, I am cutting out and pasting below the list of books I read between January and June 2007.